eve s. mosher » Archive » When prompted– RUN! So in light of that discussion, I thought I would throw out the other two ideas and see what sticks. The first is the Coffee Cup Reduction Project (CCRP). The idea is to find out why people don’t use re-usable mugs (since most cafes will both wash them and give you a few cents off your cup o’ joe). I would do this through surveying people. Then I would work with a design program at one of the schools and have a design contest for the mug, giving the students the survey data to work with. Next, have the new super cup fabricated (in a lo-energy eco-friendly way! 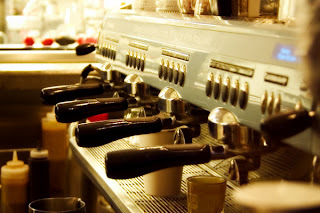 ), take those cups back out to the streets and offer to give them to people for free in exchange for their coffee cup. (Pouring their coffee into the new eco-super-cup). From all of the cups and lids collected I will create some sculptures to display with the information on how many cups there are and over what period of time were they collected. This idea also spun off the idea of the Disposable Culture – What a Waste project. Which would be a sculpture/performance/awareness piece in Union Square. First I would find out how many plastic bags are given away at Filene’s and Whole Foods over the course of a week. Then find out how many coffee cups are given away at Starbucks over the course of a week. Finally, how many plastic bottles are sold by the street vendors around the park within a week. Then I would take one week each to build a beach or nature scene using the number of items above. 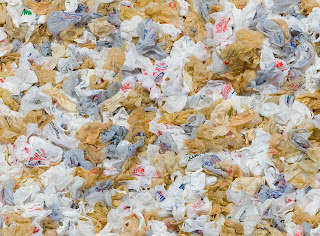 So if there are 65,000 plastic bags per week, I would spend a week in the park building say clouds out of 65,000 used Whole Foods and Filene’s bags (that I would have collected before the beginning of the building). 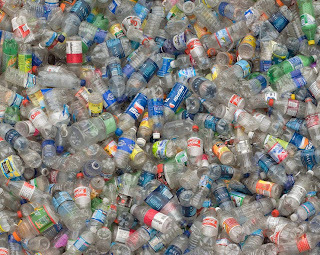 Then the next week I would build maybe trees out of the coffee cups & lids, then finally a lake of plastic water bottles. Then it could be on display for a week. 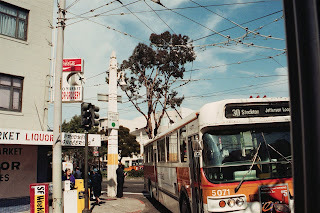 Some additional notes on the Green Seeds project, one of my dinner friends liked the idea of string going from house to house because of the reference to connections like phone lines and clothes lines. Another suggestion was green flags on the front of the building, like a symbol of belonging. So I have a lot on the plate to work on. If you have any thoughts, ideas or want to be a part of any of it – or want to help fund! Then get in touch with me! Next up: a wikipedia of artist ideas to give away. Coffee cup image courtesy of Rachel Cartwright/Gazette published in article on coffee cup waste at the University of Western Ontario. Picture of plastic bottles & plastic bags courtesy of Chris Jordan – whose studies of American culture, Running the Numbers, absolutely ROCKS! 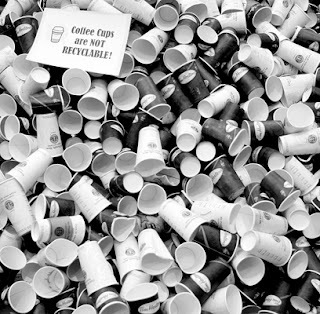 August 21, 2007 | Filed under 2007, Artwork, Blog, Proposals and tagged with coffee, coffee cup reduction project, cynthia yardley, disposable culture, emissions, fair trade, filene's, life cycle cost, plastic bottles, real cost cafe, seeding the city, starbucks, steve lambert, trash sculpture, whole foods.